IT IS a known fact that laughter is good for your health, but a recent study has shown that it is women who apparently benefit most from living life with a laugh. This entry was posted in Laughter News, Laughter Research and tagged happiness, laugh, laughter on September 29, 2010 by Sebastien Gendry. Dr. Gita Suraj Narayan, a Senior Lecturer at the School of Social Work and Community Development, University of Kwazulu-Natal (and a Certified Laughter Yoga Teacher!) recently proved that Laughter is a powerful form of complementary Medicine through her research and a series of Community Outreach Projects. 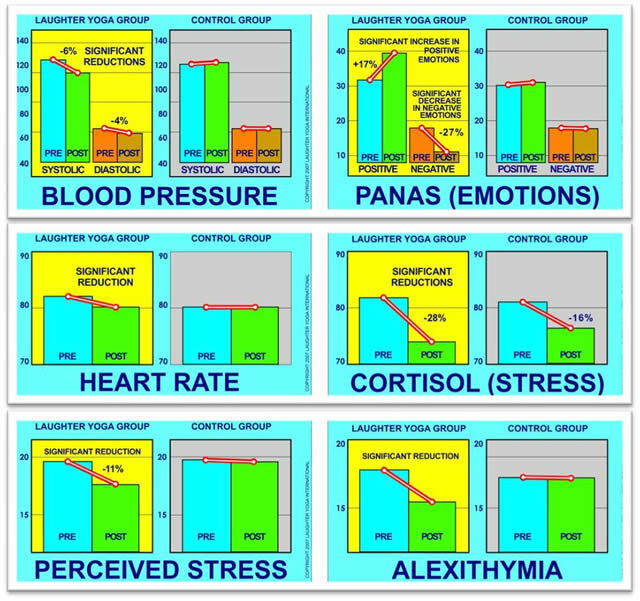 This entry was posted in Laughter Research and tagged anxiety panic, cognitive deficits, cognitive restructuring, community outreach projects, laughter therapy, laughter yoga, stroke depression, stroke patients, therapy sessions, yogic breathing on September 6, 2009 by Sebastien Gendry. Lee Berk, DrPH, MPH, a preventive care specialist and psychoneuroimmunologist, of Loma Linda University, Loma Linda, CA, has paired with Stanley Tan, MD, PhD an endocrinologist and diabetes specialist at Oak Crest Health Research Institute, Loma Linda, CA, to examine the effect of “mirthful laughter” on individuals with diabetes. Diabetes is a metabolic syndrome characterized by the risk of heart attack, blindness and other neurological, immune and blood vessel complications. They found that mirthful laughter, as a preventive adjunct therapy in diabetes care, raised good cholesterol and lowered inflammation. This entry was posted in Laughter Research and tagged ace inhibitor, adjunct therapy, c reactive proteins, crp levels, diabetes care, epinephrine and norepinephrine, good cholesterol, hdl cholesterol, individuals with diabetes, inflammatory cytokines, laughter, lee berk, loma linda university, mirthful laughter, patients with hypertension, stress hormones, stress levels on April 17, 2009 by Sebastien Gendry. Using Icy Waters, Researchers Replicated Pain from Medical Procedures. Laughter Helped. This entry was posted in Laughter Research and tagged comprehensive cancer center, jonsson comprehensive cancer center, laughter, pain management on October 18, 2007 by Sebastien Gendry. Breastfed babies with eczema experienced milder symptoms if their mothers laughed hours before feeding them, according to a study by Hajime Kimata at the Moriguchi-Keijinkai Hospital in Osaka, Japan. This entry was posted in Laughter Research and tagged allergic skin reactions, breast milk, breastfed babies, eczema, health effect, laughter on June 18, 2007 by Sebastien Gendry. Life Expectancy: A laugh a day may keep death further away. Researchers at NTNU and St. Olav’s Hospital in Norway have found the first evidence in history that proves that a sense of humour reduces mortality. In January in a particular year, all patients with chronic kidney failure in Sør-Trøndelag County were invited to participate in the study. The patients were very ill and had to receive dialysis at least once a week, some every day, to purify the blood for substances that the kidneys would normally filter out into the urine. Without the dialysis, they would die. Approximately 80 per cent of these patients provided answers to questions regarding their age, gender, education, quality of life, and sense of humour. This entry was posted in Laughter Research and tagged chronic kidney failure, humorist buchwald, sense of humor, sense of humour on March 13, 2007 by Sebastien Gendry. Social Skills: Laughter acts as a social lubricant by enhancing a sense of group identity among strangers. A study from psychologists at the universities of Kent and Liverpool has revealed that laughter increases altruism towards strangers, a finding which may have important implications for charities and other fundraising bodies. The study, conducted by Professor Mark van Vugt, Charlie Hardy, Julie Stow and Professor Robin Dunbar (University of Liverpool), was designed to examine if laughter acts as a social lubricant by enhancing a sense of group identity among strangers. This entry was posted in Laughter Research and tagged comic relief, effects of laughter, funny clip, laughter, social lubricant, university of liverpool on March 12, 2007 by Sebastien Gendry.